The group had different ideas how to spend today, Pie had a long list of people from the Studebaker Club he wanted to go and meet today, but they are far out of Seattle and he is not flying out tonight, so he is not planning on returning today and therefore we dicided against joining him. The 1,5 Pilots wanted to go to the Museum for Flight and some wanted to do some riding around Mount Reinier. I on the other hand had had eough of riding and my bum is properly sore, and decided to do the final Blog of this Leg 14 early, go the Verizon Wireless and sort-out my Hot-Spot for when we return next year and do a few admin jobs and letters and clear some e-mails. I cant therefore tell you who went where and what happened. We are all meeting up at the storage unit at 14h30 to put the bikes inside, then drop off the keys with KTM, then it is off to the airport to check-in, get bording passes and then go for a drink at one of Milsy’s mates that stays near the airport before returning to jump onthe 1st flight to New York. We sort of “lose” a day today as we start flying tonight, Friday night at 21h00 and then arrive in Johannesburg on Sunday Morning, so the whole of Friday night, Saturday and Saturday night is spent traveling home. On this leg we rode 8086 Kilometers, (these bikes which we bought for North and South America has already done 23 663 Kilometers,) we spent 94 hrs and 12 minutes riding and our average speeed for this leg was 86km per hour, and the fuel I consumed was 5,1lt\100km. There has been a lot of discussion with regards to the two trips we are planning for next year, the 1st will probably start on the 15th of July and end on the 31st of July for Milsy and I, but some might continue and even ride their bikes back to Seattle. I am considering letting a family member ride mine back to Seattle and probably Milsy’s as well, time will tell and more planning will no doubt happen over the next few months, routes planned and distances calculated all the way to Prudoe Bay on the Beaufort Sea. It looks more and more unlikely that Pie’s RV will join us on Leg 15, and also no wives as there is not much they would want to see in Canada and Alaska for them, we are thinking it will be better if they join us in September or October (Leg 16) when we go to places like Hollywood, LA, Calafornia & the Grand Canyon and Las Vegas and Death Valley, lets see what happens. Those who have followed the blog will know that I was not very excited about riding around the USA, (those who has not read the previous Legs posts will have to do so once the new Lay-out of the Blog has been done and all the previous Legs are back on line as they are now on Maintenance.) It is far more exciting to ride in a 3rd World Country as the only road you can take is where everything happens and you can find adventure around the next corner, its unpredictable, its a rush, and that is what Adventre Bike Touring is all about. So riding anti-clockwise around the USA and Canada, including Alaska was going to be painful and boring I thought. I was wrong, like usual. This Leg we started with a tour of the Great Lakes, and Tex and Dog has gone out of their way to plan our routes on this leg to go past events happening like Oshkosh Air Show and Sturgis, but they researched which back routes to take, where to find some gravel roads and they have given us the best riding I have ever done since we kicked off in London in 2012. Yes, there were days in the 241 days of riding that were very good, but on this trip the riding just got better and better, it was good riding continuesly, day after day. The loops around Sturgis must be some of the best riding in the world, the Tail of the Dragon in North Carolina on the Blueridge Mountain’s and the roads we rode there does not come close to the rides on the Needle Highway and many more. 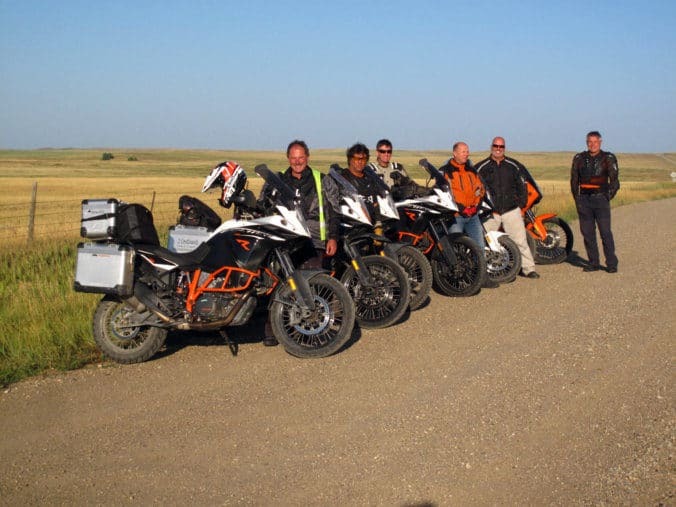 Then came the Badlands and then the 2 West, later the 20 West, and from these already great passes and scenery we looped off to do even more spectacular and amazing rides through some of the most beautiful rivers, lakes, mountains and semi-desert roads. I am often asked which country was the most beautilful to ride in, and I always say Norway as the country is small and every corner of Norway was breathtaking, but in future I will have to mention this section of America that we did on Leg 14 as most days matched the beauty of Norway. Was there any surprises for me this trip? On the previous two trips throughthe USA the politics surprised me and I think I mentioned how it seemed that Trump had polorised a nation into two opposing camps, but now that I have looked a little deeper and seen a little more I do think that in general the people are all proud Americans and all very similar regardless of how they feel over Trump, all the people like talking and are so friendly and I have seen Dog and Tex have great conversations with their fellow Americans regardless of their political orientation, its almost like they know Presidents will come and go but they are all united under their flag and are proud of it and will stand together with a drop of a hat as there is a much bigger picture than the politics of the day. My perception of the American people has also changed, as a Nation they are brilliant, have achived so much and are the leaders of the world on most fronts. In the begining I thought I would see the people as lazy, but I was so wrong, in general they are so hard working, and only gets 2 week leave per year. They are proud of the jobs they do regardless of what that job is, even if it is cleaning the Trash-can (we call it a dustbin) they do it properly and with pride. And even many Democrats have softend their stance on Trump, they would tell me that they dont like him and will never vote for him, but that ” his new policies seem to be working as the economy is improving.” And that is evident as everywhere we ride there are signs saying “We are Hiring” or “Bus Drivers Needed” & “We are hiring Servers” or Baristas, and it just seems that the Standard of Living of the poor are far higher than that of our poor people in Africa. Back home we have our poor staying in Squatter Camps, here the poor stays in a caravan, or mobile home, has air-conditioning and an ablution-block to shower and a Porta-Loo that is clean and maintained. I am not blind to the problems but which country dont have any issues with Imigration or drugs?? What I like the most is that America is still mostly a Christian country. I also think Mr. Trump has given the people a little more freedom to start standing on their rights, to have the tail wag the dog less. I saw a guy with a T-Shirt that said “I say Merry Christmas, I own a Gun, I eat Pork and I respect our fallen Heros, I salute the flag, if you dont like it, Leave.” The American people are so political correct and well mannered that they dont say Merry Christmas but rather Happy Holidays as not to offend other religions, and I think this is slowly changing as everyone has the same rights and should be respected in the same way, no one is more equal than another. But it is difficult to have an opinion on an entire nation from jusy riding around the country for a few weeks, but this is how I experienced it and saw it, and in many cases I am probably wrong, but one thing that is fact, the American people respect the Veterans and have so much appreciation for what their troops and police are doing. Many times I have heard people say to Dog “Thanks for your Service” as Dog served his county in Quwait and now serves as a Police Officer, and the people appreciate it. Here the police officer lets you sit in the police car, not for privacy so that a bribe can be paid, but for safety that a car does not drive into you. And when itwas Rocky’s turn to sit inthe car allhe could do was look at the big angry dog on the back seat, behind mesh-wire. Dog told us later that the police has a remote-button he can push that will open the dog’s door so he can jump out and attack. Last thoughts: I enjoyed the Hotel Chain called Days Inn as they offered good value for money, I am blown away by how much water this country has, there are lakes and huge riveres everywhere!!!!!! As a result the boating industry is huge, as a result of that the fishing industry is massive. So is hunting with so much of the North covered in Forrests. Unfortunately not all the hunting is for eating and still the madness of hunting a Mountain Lion as a Trophy is happening, or trapping a furry animal to make a warm hat still common. But like any senseless blood-sport it gets regulated and controled here in the USA and numbers are not desimated, like our poor Rhino’s back home. And some sports are just always going to be senseless to me, dont even get me talking about Bull Fights in Spain !!!! I hope you enjoyed the ride with me and next year we will be back with some more days riding. Ek kan nie wag vir jou volgende reis verslag nie. Lees dit elke dag en beleef jou ervarings. Great trip. Amerika kan maklik my nuwe tuiste wees. Dankie vir jou ervarings wat jy so deeglik deel met ons. Moet nog op n trip gaan hier in sa.. Thanks for a great blog – really entertaining and informative! It was good seeing three of you in Oakville.